The NFL season is in full swing once again, and if you're like tens of millions of other Americans, you're doing more than just pulling for your favorite team. Yes, we're talking about fantasy football. You've done the research, drafted the best players, and watch the stats closely every week to see how your chosen players are doing. But is it possible this $7 billion industry is having an impact on your real-world work and financial life? In 2016, studies conducted by Challenger, Gray, & Christmas, Inc. showed that 39 million Americans worked on their fantasy football teams while they were at work. On average, those people earned a little less than $26 per hour. Add it all up, and those fantasy teams cost employers just under $1 billion each week. Multiply that by 17 — the number of weeks in the regular NFL season — and the game could cost American employers up to $17 billion each year. As unbelievable as it sounds, $17 billion may not actually hurt the overall economy too badly — but this habit can also hurt your own your bank account. The same study showed that the average fantasy player spends about $556 per year on this beloved game. This money goes to joining fantasy websites, paying dues to their team or league, and time spent researching players. This hurts individual wallets a little, but it pumps just under $32 billion in revenue back into the economy. In today's increasingly digital world, it's easy to blur the lines of personal and professional duties when you're at work. Many people use their own private phones while they're on the clock, or use the internet to conduct non-work-related business, including fantasy football research. This may slow productivity slightly, but it can actually also have a positive impact on the job. Many people report making new business contacts or earning the trust of new clients while discussing fantasy football. Even more say that participation in fantasy football has helped them build better relationships with their coworkers. They have also seen improved communication between departments, better workplace morale, and even better relationships with customers. Although you may get away with conducting a little fantasy league business on the clock, the game itself can be expensive, especially if you lose. Many players who come in last place in their leagues are not only out the money they spent on the game, but they must spend even more cash on their punishments. Some of the most common forms of punishment are buying drinks for all the other fantasy league members, and hosting (and paying for) the season's Super Bowl party. 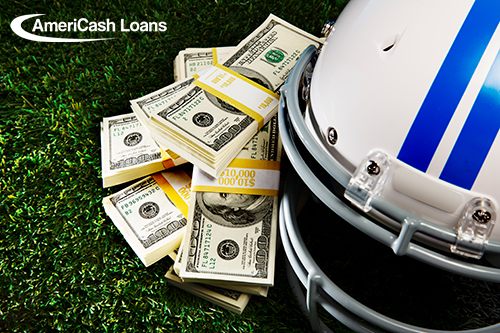 If your fantasy team isn't as successful as you hope this year, handle the financial aspects of your losses with a little help from AmeriCash Loans. We provide fast, easy, and convenient loans of up to $4,000. Apply today!